Samsung’s most popular Galaxy mobile line up just got a new member Galaxy R. It fills the gap between Samsung’s two best selling mobiles – Samsung Galaxy S and Samsung Galaxy SII. Galaxy R leaked previously as Galaxy Z, now Samsung officialy announced it as Galaxy R. Samsung I9103 Galaxy R is a cheaper alternative to current smartphone king Galaxy SII. Samsung I9103 Galaxy R specification is really good, it is powered by 1 Ghz Nvidia Tegra 2 dual core processor with 1 GB RAM, which is very common nowadays among all high end smartphones. Galaxy R will have 4.2 inch Super Clear LCD , so no Super AMOLED plus like Galaxy SII. Samsung Galaxy R will run most recent Android operating system Gingerbread 2.3 with custom Samsung Touch Wiz 4.0 user interface. It has 5 megapixel autofocus camera with LED flash capable of recording HD 720P video. So it’s a downgrade from Galaxy SII which has 8 megapixel camera with Full HD (1080P) video recording. All usualy connectivity options like Wi-Fi b/g/n, Bluetooth 3.0, HSPA+ are present in Galaxy R. Samsung has not announced official release date of Galaxy R till now. Are you excited about Samsung Galaxy R? Share your views with us. 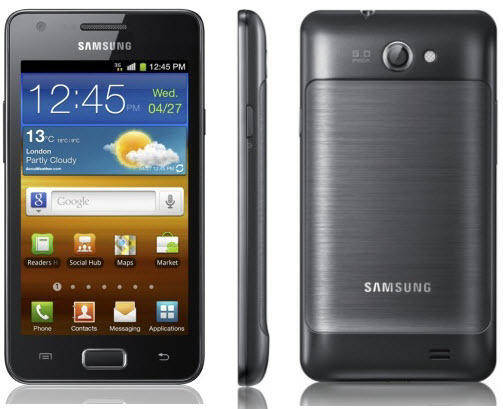 Features and functions of Samsung Galaxy R is same Samsung Galaxy S II. Galaxy R designed in 5-megapixel camera. The important feature of Samsunf Galaxy R is 7 side-scrollable panes, so that we can easily zoom in/out text and images.